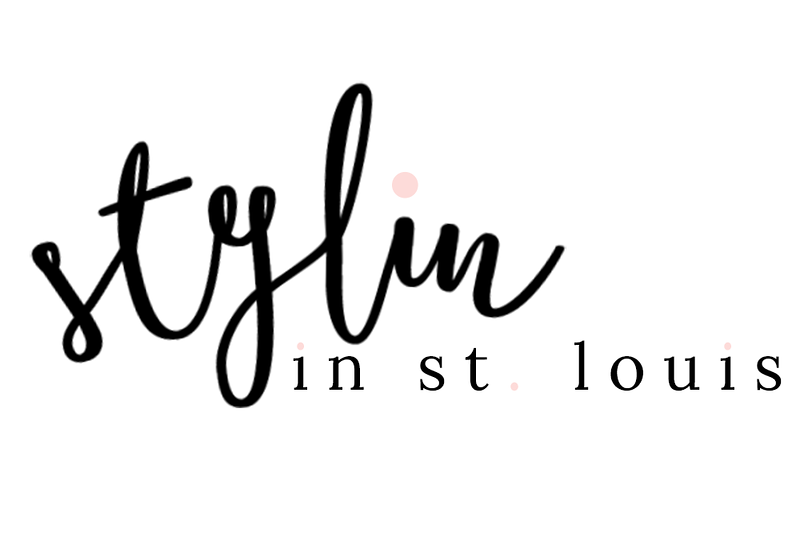 Stylin in St. Louis: Spotlight of the Week: Holiday Glam…. Spotlight of the Week: Holiday Glam…. Happy Thursday! I only have two more work days then, I am off for the rest of year! I am so ready for a little time off! This week, our spotlight weekly theme is holiday glam! 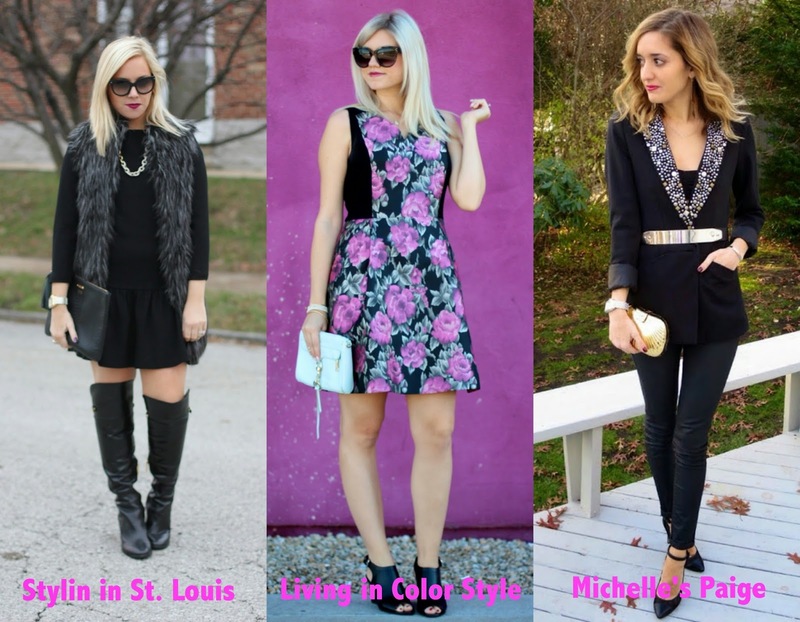 The holidays are the perfect time get all dressesd up in your favorite holiday looks! I went with this black look and added some sparkle accessories to give a more glamourous look! Come share you holiday looks with Elle and I! 1. 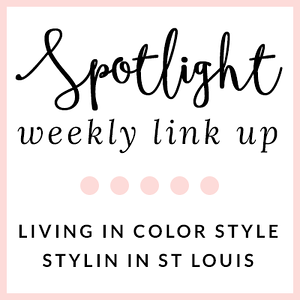 We kindly ask that you follow the two hosts: Elle from Living in Color Style and Jacqueline from Stylin' In St. Louis via Bloglovin or GFC and of course our co-host Michelle of Michelle's Paige . Spotlight: Our spotlight this week is Tatiana of We Shop In Heels! Tatiana has the perfect holiday look! The pops of red add the right amount of color make it fabulous! Her cute pup is a great accessory! Be sure to check out her blog! Next week: The next two week we are taking a break for the holidays! See you in two weeks! Our theme is prints and patterns! Have a great holiday! I just love these kind of looks ! Very nice ! All 3 of you look gorgeous and perfect for the Holidays. My favorite is your edgy yet feminine, fun and sophisticated all-black look. Darling trumpet-skirt dress and I love the OTK Boots. I also love Michelle's Style. She looks great in her Tuxedo Blazer! Enjoy the rest of this week Jacqueline and as always such a pleasure stopping by, linking and commenting. You look gorgeous, love this all black look. Me too I cannot wait for Friday, I need this break. You look so cool and just stunning!!! Love this! The boots, the vest...all of it! You all look gorgeous in these holiday outfits, love your chic black dress with that amazing fur vest!! Look at you, sassy girl! Love the faux fur vest + the over the knee boots! What a gorgeous holiday outfit! That vest is amazing and is perfect with the black dress and otn boots! Have a wonderful holiday! Love the dress! I almost ordered that on Black Friday from J.Crew and now I am wishing I had. Looks fabulous on you. You look amazing! Love the vest! Looks so warm and snuggly! Love the short dress and boots. Beautifully styled Jacqueline. Great style Jacqueline - I love that you look so chic and cozy! Those are some pretty hot boots! This is indeed holiday glam at its best - love the mix of textures within a monochromatic ensem!! Wishing you the best of the holidays too!!! love this outfit, it's so chic with that faux fur vest! What a great vest, you look stunning! Well aren't you looking fabulous in this all black look! I love that faux fur vest! Have a great long break, see you in the New Year! I'm obsessed with fur vests and dresses! I love the color of your vest! So glam! Loving that faux fur vest!! Love, love your fur vest! Looks so cozy! Okay, I really, really love this look. The all black is so chic and those boots!!!! Gorgeous! I need this entire look in my closet! So adorable! Love the drop waist dress. And the fur vest is perfect. Thank you so much for the feature! That's an amazing fur vest! You look so glamorous. Happy holidays! Love love love this so much!! That is the perfect fur vest. I feel like mine are too bulky. This is so fab on you! Simply gorgeous! I love the fur vest and the boots! That black dress from J. Crew is the perfect dress and I could totally see you dressing it up or down! I really love the darker fur vest with it, too. This is a perfect winter layered look! I love the cozy vest - pinning!